Neymar showed why he is carrying Brazil's hopes at the World Cup, scoring twice on Thursday to help the underwhelming hosts escape a disappointing start to the tournament. With Brazil struggling and down a goal against a spirited Croatian team, Neymar came through to lead his team to a 3-1 win in the opening match, scoring once in each half. The killer goal to make the score 2-1 was a hotly contested penalty awarded by Japanese referee Yuichi Nishimura. "Things weren't going well," he said. "The first match is always difficult, we were anxious, we were nervous. I'm glad I was able to get the goals we needed at the time we needed them." "He is a special player and we know that," Brazil coach Luiz Felipe Scolari said. "And he needs to know that we know that." Brazil got off to a slow start in its home tournament. Defender Marcelo found his own net while trying to clear a low cross by Ivica Olic in the 11th minute, stunning the crowd of more than 62,100 packing the Itaquerao Stadium. But Neymar equalized in the 29th, firing a perfectly placed low shot that went in off the post. He said he didn't hit the ball perfectly, "but it went in, it's all that matters." 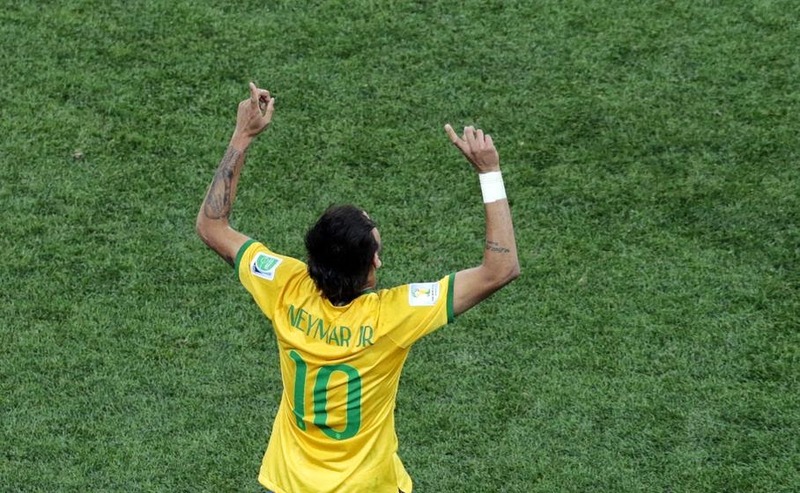 "It's important to start these tournaments on the right foot, with a victory," said Neymar. "I'm happy that I got to score, but the entire team deserves credit. We maintained our calm and showed we could battle back." The game turned on a controversial penalty awarded by Nishimura in the second half after striker Fred went down inside the area under minimal contact from defender Dejan Lovren. 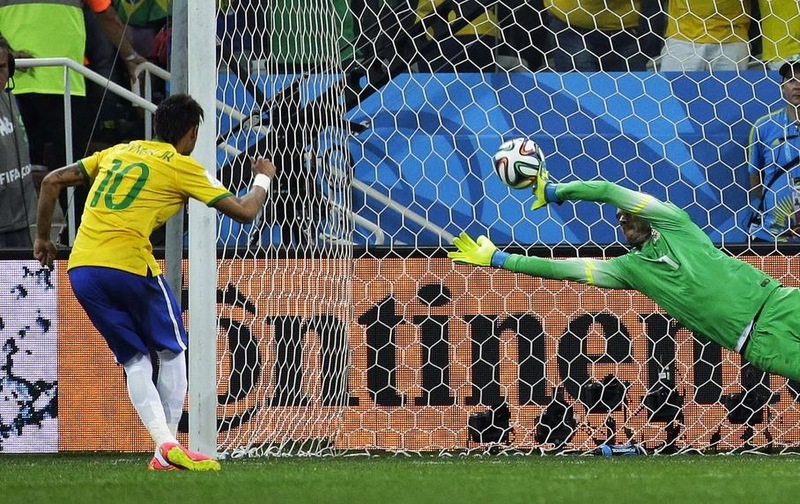 Neymar scored from the spot in the 71st minute, getting his 33rd goal with Brazil. 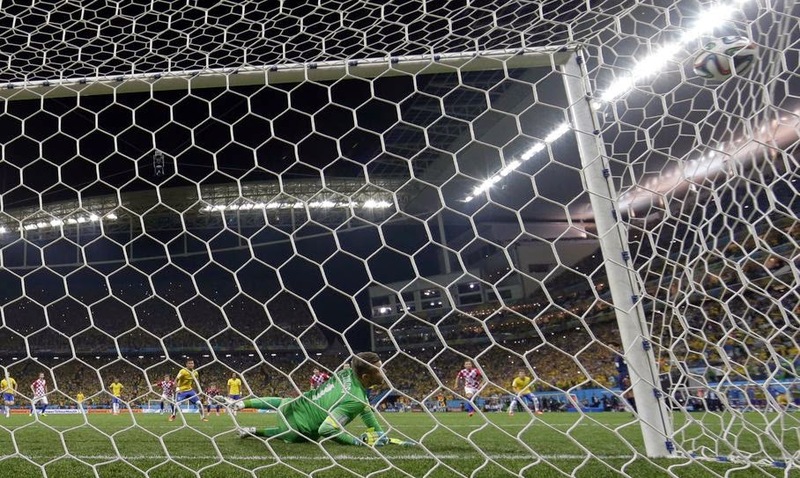 Croatia goalkeeper Stipe Pletikosa nearly saved Neymar's shot, but it was struck hard enough to deflect into the net. "If that was a penalty, we should be playing basketball. 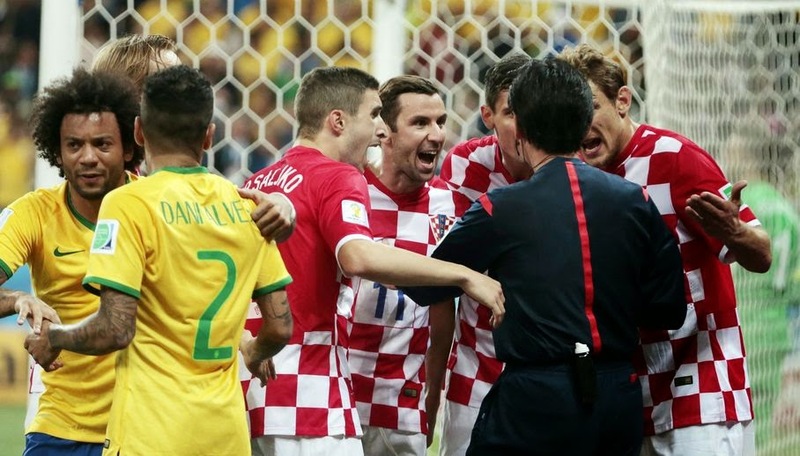 Those kinds of fouls are penalized there," Croatia coach Niko Kovac said. 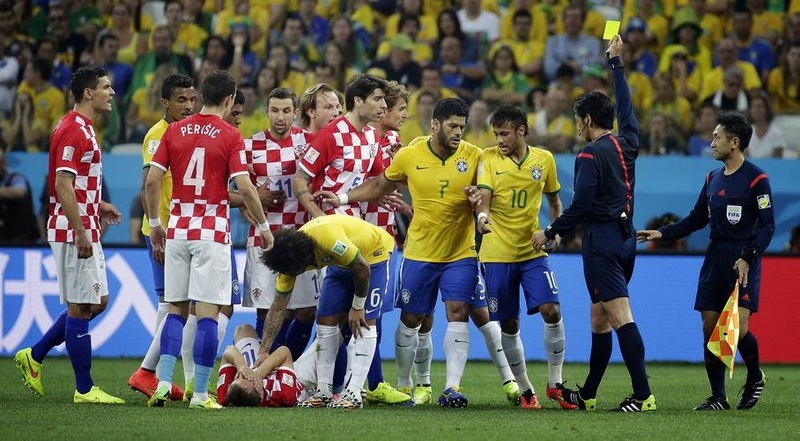 "That is shameful, this is not a World Cup referee. He had one kind of criteria for them and another for us. 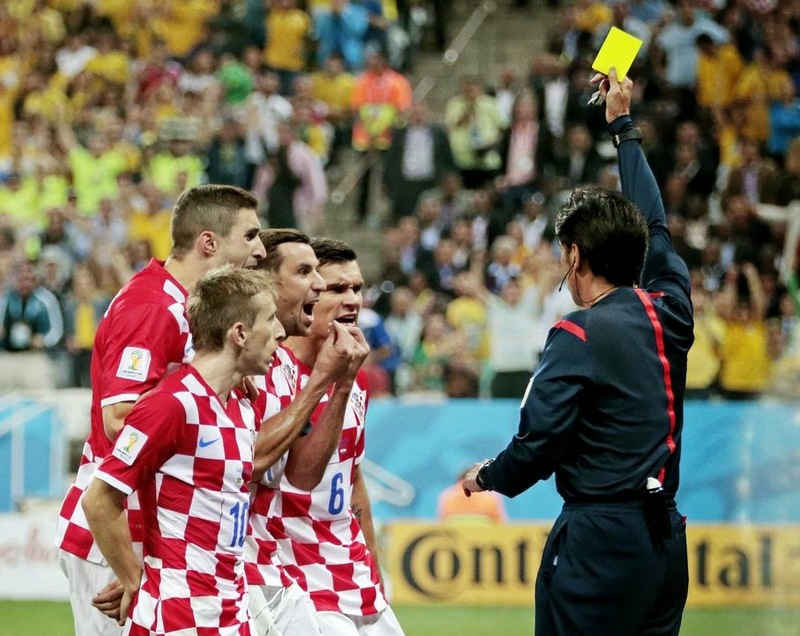 The rules were not the same," Kovac said. As Croatia searched desperately for an equalizer, Oscar added to the lead in the first minute of injury time with a toe poke from just outside the penalty area. A draw would have been a huge disappointment for Brazil, which had won its opening match the last eight times and is overwhelming favorite to win the competition. "The team didn't give up," Brazil defender David Luiz said "We knew it would be hard but we played well and got that first goal and then the victory." The tournament finally got underway as planned after months of talk about the preparation problems that plagued Brazil since it was picked as host seven years ago. The troubled Itaquerao, which wasn't fully finished for the opener, held up without major setbacks to fans or the match itself, although part of the lights atop the pitch went out a few times for brief periods in the first half. Brazil: Julio Cesar, Dani Alves, Thiago Silva, David Luiz, Marcelo, Luiz Gustavo, Paulinho (Hernanes, 63), Oscar, Neymar (Ramires, 88), Hulk (Bernard, 68), Fred. Croatia: Stipe Pletikosa, Sime Vrsaljko, Darijo Srna, Dejan Lovren, Vedran Corluka, Ivan Rakitic, Nikica Jelavic (Ante Rebic, 78), Luka Modric, Ivan Perisic, Ivica Olic, Mateo Kovacic (Marcelo Brozovic, 61).